Regal and elegant, the Intricate Swirl Frames Die is sure to lend a touch of grandeur to all of your paper crafting creations! Filled with delicate swirls and intricate detailing, the exquisite die cuts created with this collection are ideal for dressing up card fronts, creating fanciful card bases, as well as beautiful framing elements for scrapbook layouts! 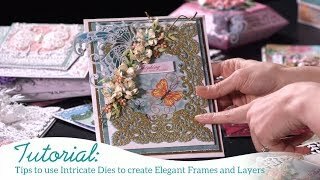 Designed for use in the traditional style using all coordinating layers together, as separate embellishment pieces, or for assembling unique configurations for a variety of stylish looks through mixing and matching, these beautiful and intricate dies are sure to become a favorite!